20, of St. Croix, Virgin Islands. Rosario died in Balad, Iraq when his HMMWV was struck by enemy indirect fire during patrol operations. He was assigned to the 5th Squadron, 7th Cavalry Regiment, 1st Brigade Combat Team, 3rd Infantry Division, Fort Stewart, Georgia. Died on October 19, 2005. Please send information, photos, and corrections for Army Spc. Jose E. Rosario. "It's been years, but you're still missed and you live on in our memories." "I love and miss you dearly!!" "Cuz. Fam. Bro. Son. You don't know yet...but we miss you"
"OMG!!! Jose I miss you so much I know it's crazy I had my son Zion on this day The Lord decide to make you an angel I'm happy I could it haven't been a sad day anymore since I have something to smile about I miss you and love you my guardian angel"
"Wow today 8 yrs ago you've been gone. N I know to a much better place, in Heaven "The Promise Land" sittin to the right of our father almighty. I still cant believe ur gone. I remember times we hanged around always had a smile on my face beautiful wonderful person u were and still is. May the good lord bless ur soul and soon we meet again in Heaven. Ur truly missed but you'll never be forgotten. R.I.P. Jose..."
"Looking true my closet and find shirt from basic ,remember good days ,lol one of the thing was we are on field Fort Knox during navigation yelling on each other which way should we go ,then from nowhere Ordiway shows up asking for skittles me and Rosario bust laughing,he was and still going to be one of best people i meet in my live RIP bro"
"Smh Jose I miss you dawg times was good in school wid you all them jokes we use to crack when I got that call everything went dark dude having the same name it got confuseing at times but it was all good guess wah dawg u are a tru souljah now in gods army R.I.P dude it's all love guide the ones you love till we all meet again"
"The brothers of 5/7 Cav have not forgot you. Two strokes and a lot of recovery later, I am soon to hang up my spurs and retire. People may have forgot about Iraq but...WE WILL NEVER FORGET ABOUT YOU!" "Although seven years have passed since you left this earth not one day passes that I do not think about you. I will always love you. We all miss you so much." "I miss you man, i still remember the big party we planed in Florida, right before. you will NEVER BE FORGOTTEN!!!!" "Sending hugs to your family, I'll never forget your Son, Brother, Cousin, Nephew, Uncle - Jose...nor will the brothers that served with him forget." "I'm here at WLC, Fort Stewart, still thinking & talking about all of you. Y'all will forever live in my heart. Brothers Forever!!!" "Six years now and I get by but never over that night. We lost SSG. Tate in Afghanistan in July 2010. The only family picture of he, his wife and daughter was taken by my wife while he was on leave. Don't take much to remind me of you or any of the 5/7 brothers we loss. I have all you guys pics in a special photo album on my facebook page. It's up to us to make sure that nobody goes forgotten. We are all we ever had, brothers one and all." ""To the family of Jose E. Rosario ,I am so sorry for the loss of your love one.He died a hero.May you know the peace and understanding that only comes from God. Hopefully we will all meet in Heaven one day where we will rest in the arms of Jesus. If you need someone to pray with you or talk to please call or write my pastor at Gateway Community Church,Rev John B Pearrell 11677 Brown Bridge Rd. Covington Ga. 30016 phone 770-787-1015""
"Happy Belated Birthday I luv you....ur neice"
"October 16, 2009, and I'm already deployed. Just yesterday I was home at the beach under a palm tree eating chicken leg and johnny cake. It's crazy over here. I got a promotion, and I was thinking "yeah more money" but now I have so much people under me asking me questions that I would be asking them or I wouldn't even know the answer to. I'm in charge of 39 people and when sh!t goes down, they ask me "Isidore what do we do?" and I feel like I need time to think about the right option but I don't even have time to think. Anyway, I'm not gonna put out confidential info on this message. We still miss you, and now that I'm 21 years old, it seems to me that you died young. I don't even know how long this message is or what to type anymore, a computer is not even available too much, I only have 20 minutes on this thing and I just wanted to put out that I didn't forget you, if you reading this, and to let you know I lost so much people after you that my mind don't function the way it did before. I was on St. Croix on a 2 day vacation. I REPEAT. I was on a FOUR DAY PASS to go home and be away from all this chaos and it takes a day and a half to reach home and a day and a half to get back so i really only spent about 32 hours on the island. But when i went home, I didn't care if you rob me, if we had problems in the past, i didn't care how good or bad it was between me and anybody, I was happy to be on that island and happy to see everybody. that was it. Y'all have no idea.... Anyway, I'm out... Thanks to everybody who support the troops and thanks to those who serve or at least attempted to." "You will always be in our hearts and in our lives forever...you were one of the craziest people i knew...although u are my uncle u have always been like a brother to me...you were taken to soon from us...and i miss u..14 yrs with u was not enough..RIP Jose...i will never forget u...n your story will always be told...Love always..Your niece"
Hey brother there is not a day that goes by that I don't think about what we talked about in the 3rd ID replacement barracks when I first met you in DEC 2004. It seems like such a long time ago man. I also cant help but to laugh about the time me you and Miller went out to Savannah while we were still and the replacement and we got drunk and you had to DD us because you were under age and could not drink, and on the way back to Ft. Stewart a cop pulled us over outside the front gate and you didnt know how to roll down Millers car windows and the cop got all pissed off and made you get out for a breathalyer. Well you were sober and he let us go but the way you were laughing and trying to get that window down always cracks me up. You went to 5/7 and I went to 3/69 and we never saw each other again. Im sorry I didn't bring you that beer the day before we left to Iraq. I still have that text on my phone, but I promise when the Lord takes me I will be bringing up a keg. "Jose, every year come october i sit in some random bar and drink a shot for you nahvi,lake,mora,knox,and gooding.Every year I tell people the story of all my hero's that fought that year and gave all for everyone else.I have a tattoo of your name and there's on my arm and I honor you every chance I get.I miss you man. rip"
"March 17, 2009. It's Deon again. Rest In Peace Batman. I'm getting deployed to Kosovo in August and I shouldn't say that I'm scared... but I am. This is like a Black Hawk Down mission. I'm only staying strong because I see others around me are falling apart and they'are asking me to help them out. For everyone who is serving, who have served. and who are trying... I'm proud of you. I turned this into my life. And for everyone else... Thank you for your support." PFC Deon Josias Isidore of St. Croix, U.S.V.I. New year, same pain. We all miss him with all our hearts. A friend like no other, a cuz that was along the lines of being a brother. We spent 18 years together, good times, bad times and great times. This wasn't only a great soldier, but a great person and family member. I was told you can't pick or choose family, only your friends. And the fact that he was my family and my best friends speeks alot about him. He will be missed forever by all he loved and won't be forgotten by the ones he gave his life for. He will always be in my thoughts and in my heart. With mad love. His cuz." Jose gave the ultimate sacrifice and will be held in the hearts of American forever. I cannot and will not let our fallen heroes be forgotten. My deepest sympathy to you. "Some gave all." "Batman (Jose)...I don't know what to say... You were the first friend I had in High School six years ago, one of the few people who changed my life. Now, I'm here in AIT, walking around with body armor doing the same thing you were doing. This is what we signed up for, and we have dedicated our lives to serve this country. I'm proud of you. Rest In Peace." PFC Isidore, Deon of St. Croix, U.S.V.I. "u is one brave dude for risking everything u had and fighting for the VI.Ppl still talkin about you down here..u kno we gon neva forget. I rememba tha one time u kick my * in basketball in front of my gyul at the time...u lucky i didnt feel like playing...lol...miss u b." "jose you were like the younger brother of c troop i will still never forget that night you were showing every one how to dance youre family will always be in my prayers"
"Your birthday just passed, you would have been 23. It's strange, cause with all this time that has passed, it still feels like we talked yesterday, the very same night that you passed. Christmas is coming up and i remember we said we would spend the next one together when you came back again. It hurts to remember, but if we don't who will. It's sad to hear the ignorant talk about soldiers dieing without a cause. When you died so that so many others wouldn't have to. You gave your life to save so many. I read that comment about what you did pulling out them guys. When Jose told me what happened, he was humble and said he just helped his friends out in an accident. Yet i see your page and only see that you got an arcom and a purpule heart. I'll check into it cuz, but i'll make sure you are honored like you should be. Nothing but love, and your still in my thoughts. Your cuz, but you know you was like a brother." "Everytime i look at myself in the mirror in my uniform i think of you. Your my inspiration to go on and do what i got to do. I missing you and well. Much love cuz." "hmm, It's been two years since, but my love for you will never die. Still missin you and your silly ways that always made me smile. Shmisly!" "I remember the fist time we met and we was cool from day one. I will never forget the fun we used to have, you will always be my homie. one." "I remeber when i was the NCOIC of the front gate and we use to do gruad duty together. Jose youu always had a smile on your face and never complain even tought the work was tough. You were a good soldier and a even better person. all of us at 5/7 will miss you. My heart goes out to your family"
"I remember Jose from the High School of St.Education Complex. I remember his smile. That smile he always gave when he saw his girlfriend Helyne. When I heard the news through a friend I was devasted. He will be truly miss by those who knew him and those who didn't know him very well. To the Rosario family I'm truly sorry. Jose your gone but never forgotten. "My love, i don't know if something is wrong with me. Up to this day i cry when i think of you...I miss the person who always had that silly smile on his face, and who was always considerate. SHMISLY!" "Jose Rosario, your death was a tragedy to all of us. It haunted our thoughts day after day. You were more of a friend to evryone who knew you. You were special and never treated anyone wrongly. We all miss you and love you very much. Our hearts are still bleeding from pain because of our misery. Without saying good-bye or any farewell. Crying for weeks will never help but still you are loved. Juanita also misses you. We all do." "A year ago tonight Oct 19...was the worst of my worst nights in Iraq. We laughed and joked about the food being served then, less than 45 minutes later...I would never hear your voice again. Well my friend, I am one who will not forget you. No need for me to take time out of a busy day to remember my friends. I hope your family is doing well." "It was a year ago today that Jose pulled Cpl.Young and Sgt.Hagood out of their hummer that was hit by a IED. He was their gunner and at the time of the blast... crouched down in the vehical. Didn't get a scratch on him! We all sat in the bay and talked afterwards and looked at the damage done to their vehical. Sgt. Brooks was burned in the face. Jose kept watch over them until help arrived. He had zero reguard for his own saftey, he protected his squad members from harm on that dark night in Iraq. He is whats best in men who serve in combat. 38 days later we lost him. Long as I live, he will not be forgot. This promise is made to a family I never met. My God and time, heal & fill that void in our lives without Jose." Leonard Brownfield of Fort Stewart, Ga.
"I remember the good old days of junior high when you use to come to your mother's job after school and we use to hang out and talk a whole lote of craziness. Not to mention the late night phones talkin about them girls haha it was the best. Oh and let's not forget the 7th grade class trip to Puerto Rico. It was like we were est friends in those days. I gonna miss you buddy." "I will Never Ever forget you man. I pray that time will heal the pain. Trease & I still talk about you and smile as best we can. We miss you today and everyday..."
"Rosario... My Brother, you fought through everything the Drills could throw at you. You came out on top of it all and sacrificed your life to safe our fellow Cav Scouts. You told me how you wanted to improve yourself and I know you would have carried it out if circumstances not gotten in the way. You will always be remembered, my brother. I will come and visit you as soon as I can. It is men like you that define who we all are and can be. It was my honor to know and serve with you." "To the family of Jose Rosario, I'm sorry for your lost. I was a Drill Sergeant right across from the barracks where Jose did basic. The reason I knew him because I caught him being mischievous. So everytime I seen him I would asked him was he staying out of trouble.Rosario was a harlirous soldier. Well Rosario take your rest soldier its well deserve, and I'll see you on Fiddlers Green." "Jose and Russell are watching over us now, so do the best you can with the rest of your life to make them proud. They succeeded in making us proud, now it is time to make them proud." Did you know how much you meant to me? Did you know how I cared for you? Did you know that I built my life around you? That I tried to include you in everything? Did you know I Dreamt about us? Remember all the places we wanted to go to? All the things we wanted to do? But you made my life worth-while. You were always the one in my heart? Although you gave me the credit for your change in persona. Did you know the impact you had on me? And how thrilling it was to be sneaky. And most of all the joy of being in love. Did you know that I appreciated you? That I was grateful for the times you were there for me. Can you remember when you brushed my hair? With no fear of being seen. I loved how you listened? That no one listened quite like you? That�s why I loved talking to you? That you made my days enjoyable? How I loved your jokes? That I really didn�t want you to go. But I didn�t want to crush your dreams. To leave me here all by myself? How much we wanted to die together? To hear of your passing? Did you know how hard it was? Trying to comfort your mother? Did you know you were going to die like this? Was that the reason for the poems? Why, why haven�t you answered me? That I would feel like this? That I would come to love that ugly frog? That it would be my new best friend? That I would talk to your pictures? How precious our moments would be to me? I would end up wishing that I did more? That I wanted to go down with you? Wishing to speak to you? Wishing that you were still there? Wishing to see an email from you? Until you came back home. How much I still love you? How much I miss you? How much I still cry for you? That I was actually waiting for an answer? How proud I am of you? That you could make a name for yourself. That you could be successful! Did you know how that made me smile? Did you know what made it even better? Did I know you prayed? Did you know that I prayed for you? You wouldn�t be able to think of how much. That I talk to you everyday. That I Still pray for you? Estoy Enamorado de Tu !" Helyne Joseph of St.Croix U.S.V.I. E-MAIL ME I THINK, HE WAS IN 5-15TH CAV FT KNOX. TIMOTHY.BROWN12US.ARMY.MIL"
My deepest sympathies. My son Russell Nahvi was lost in the same attack. I know that Russell thought of the Charlie Company soldiers as his brothers, and I'm sure Jose and Russell are in a better place together as brothers waiting for their loved ones to join them someday. They were our heroes, they will be sorely missed but from above they are watching over us all, our guardian soldier angels." "OMG!! Jose!!!! I can't believe that you are gone!!! Just the other day we were laughing and chatting on MSN... you asking me those silly questions that you alwayz ask!!! I'm going to miss your jokiness and ur ability to make me laugh even when i'm going through the ruffest times!!! Reynaldo, Santos... i wish you and your family all the best... I know you're going to miss him more than I am!!! LOVE YOU JOSE!!!" "JOSE THANK YOU FOR SERVING OUR COUNTRY. MORE SO FOR BEING A MILITARY BROTHER TO OUR SON GREGORY. THAT MEANT THE WORLD TO ME. WE LOST GREGORY LAST YEAR IN BALAD, IRAQ. JOSE YOU HAVE NOT GIVEN YOUR LIFE IN VAIN. YOU ARE A HERO! AN YOU HAVE TOUCHED THE HEARTS OF SO MANY. PLEASE FOR JOSE AND ALL THOSE THAT HAVE FALLEN. REACH OUT TO YOUR COMMUNITY AND POLITICAL LEADERS TODAY. REQUEST A STREET BE NAMED IN HIS HONOR. IT IS THE VERY LEAST HIS COMMUNITY CAN DO DO FOR JOSE. JOSE NOT ONLY SERVED HIS COUNTRY; HE SERVED HIS COMMUNITY, COUNTY AND STATE! ALL WILL NEVER FORGOT HIM WITH THE STREET NAMED AFTER HIM. GOD BLESS!" "I am deeply sorry for your loss. May you find comfort and strength in God to face the days ahead. 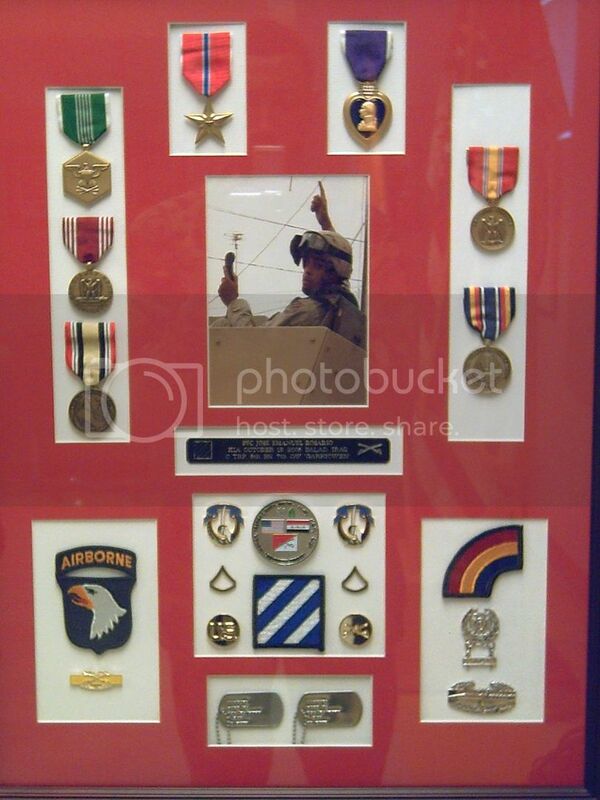 KIA in Baghdad on 24 April 2005"
"Thank you Jose Rosario, you will not be forgotten. Your bravery goes beyond words. I want to express my deepest gratitude for your sacrifice. To the family and friends, my prayers and deep condolences in your loss. May God strengthen you from knowing that fellow Americans and people around the world care about you and grieve with you in your loss. God bless you all. A very appreciative fellow American,"